ABBOTSFORD – UFV invited donors, government representatives, and other funding partners to the Abbotsford campus on November 26 to express appreciation for those investing in education. While student tuition fees are an important funding source for the university, they cover just 30 percent of the cost of a university education. The balance of funding comes from government grants, research grants, donations, and other external sources. 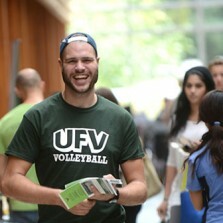 “There’s no better investment than education, and our students know that,” noted UFV President Mark Evered at the event. “I want to acknowledge the investment, faith, and confidence students have in our university. But it’s also important to recognize that students aren’t the only ones investing in their education. Taxpayers, through government grants, and donors, through scholarships and bursaries and other investments, play a key role too. Thomas Davies, president of the Student Union Society, and David Leis, UFV director of advancement, also thanked donors and funders at the event. Abbotsford’s Mike Welte, an UFV alumnus who is now an established professional, spoke on behalf of donors. Chilliwack MLA John Martin, who is both an alumnus and a former professor of UFV, spoke about his long relationship with the university. Chilliwack MLA Laurie Throness also attended and reiterated his government’s support for education. Chilliwack MP Mark Strahl wished UFV students continued success and emphasized the significance of federal government support for education through transfer payments and research grants.